I don’t dislike it, I detest it. I don’t need yet another bill from AT&T to sit on my desk. I pay it all online anyhow. I’ve signed up for internet only billing with a few companies, but for some I’m so panicked about not receiving the email (think mortgage) that I really want it sent to my physical address. I’ve eliminated some of the obvious junk with 41Pounds, but there’s got to be a way for me to still get traditional mail without the 42 dollar footprint (no that’s not a typo), well, someone had the idea to stop fighting the postal system and migrate to a virtual mailbox. 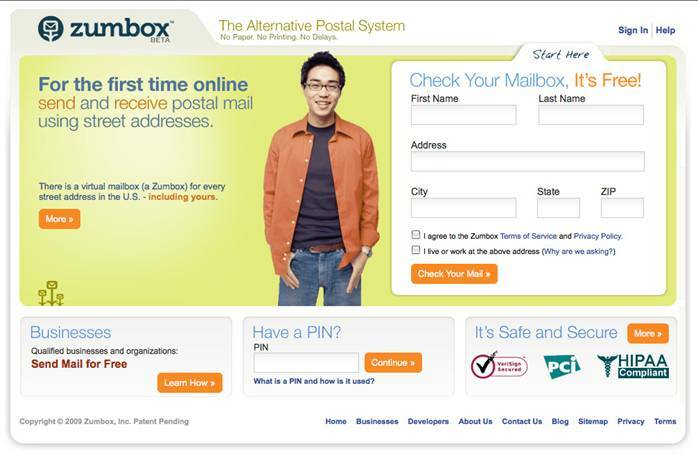 So here’s the thing, you go to Zumbox and you enter in your home address. A few days later a PIN comes in the mailbox and you have integrated your online mailbox (it’s a permanent one). It’s free for business and for us, but marketers will have to pay. *OhMyGawd* talk about targeted advertising! I spent the morning adding my important contacts into Zumbox. My email is overflowing with 100-1000 new pieces a day. In there I have everything from a plea to pray for your Aunt Cindy who had a coconut fall on her head, to my 1098’s from Morgan Stanley. So yeah, I totally missed your kids’ birthday party, the evite slipped through the cracks. Really. I’m sorry about that. You see I still need the pony express, not because they’re so reliable (my home route is a training route so it stinks), but because I’ve got to be sure that I can put my hand on a bill or a statement. Okay, so what’s the benefit if I’m going to print it up anyhow? There are some cost benefits to Zumbox that shouldn’t be ignored. Since I’m a mommy blogger and not a scientist nor an accountant I won’t differentiate between fiscal and environmental costs. Within each of those four points you could write a whitepaper on the benefits of rolling back your USPS involvement. Businesses are supposed to be more accountable, and consumers are more discerning than ever. Do you see how your 42 cents just turned into 42 dollars of waste? Is my soapbox tall enough for you? When you get down to it, every mom is a CEO. If you add your friends and family to your Zumbox account now, you can send that really annoying detailed Holiday Newsletter in a flash. If you’re worried about security, don’t be. Apparently they’re safe enough for HIPPA (which is like 18 notches more secretive than the NSA). that claim about security sounds a bit hypish… 18 notches about the NSA? what does that mean? What does HIPPA security mean? I wouldn’t trust anything put into email anywhere. Janet, sorry, I was being cheeky. It is a HIPPA approved business and if you’ve ever sat at a table with a physician or tried to get information from a doctor’s office about your spouse or you child, you’d see how stringent HIPPA is. Still am not sure how this works unless every business and person you know is on it. I just don’t see the point yet, unless I am missing something. I keep reading reviews of this, but not once have I seen how I send or receive mail to anyone not using this system, which is most people. Am I wrong?